Heroes Vs. Aliens is a crossover event that begins today in the Arrow-verse on the CW Network. The Flash, Green Arrow, Supergirl and Legends of Tomorrow converge in a 4 episode series. An alien invasion brings the protagonists and numerous extended universe characters together. The alien invaders plot line is inspired by the 1998 DC Comic’s saga, “Invasion!”, written by Bill Mantlo and illustrated by Todd Macfarlane, in which an alien alliance launch an invasion of Earth. 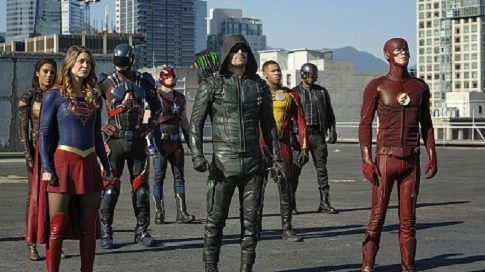 In this TV crossover event, an alien civilisation called the Dominators attack Central City, The Flash travels to Star City and requests help from the Green Arrow. The two universes have overlapped in previous seasons (most notably in Legends of Today/ Legends of Yesterday). It becomes clear that the conflict against the Dominators is a challenge that may exceed even their powers. The Legends of Tomorrow are recruited, and Barry and Cisco (Carlos Valdes) dimension jump to a parallel universe to bring back Supergirl. To further complicate matters, a shocking secret related to Flashpoint will also be revealed to the superheroes for the first time. This crossover events opens up in Supergirl scheduled to air tonight. The episode is gatecrashed by Barry Allen and Cisco who ask for Kara/ Supergirl’s help in battling the Dominators. Arrow in Episode 2 of the mini-series will enter the fray on November 30th.